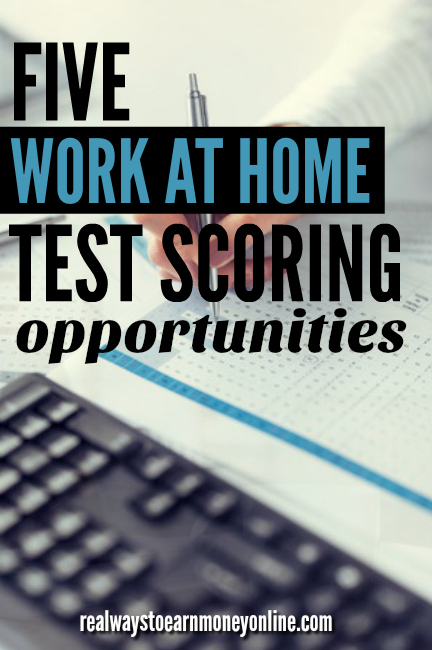 Looking For Work at Home Test Scoring Jobs? Here are 5 Legit Options. Published August 24, 2016 By Leisa Good This post may contain affiliate links. Regardless, I only recommend sites I've researched and/or used and trust. Are you looking for a non-phone job? Would you like something that challenges your mind and reasoning abilities more? How would scoring student essays sound to you? Well, then this post may be of interest to you. Five work at home test scoring jobs will be briefly reviewed below. You may have already heard of this one as there is a WriteScore review on this blog. While the company does have a website for potential clients to sign up, the work-at-home jobs are almost always found on CareerBuilder. As an independent contractor, you will be paid to score essays written by elementary, middle school, and high school students. The pay will vary depending upon how quickly you can move through your workload. From what I have seen on CareerBuilder and on Indeed, most scorers average from $9 to $15 an hour. While there really aren't any scheduled hours, you are given deadlines some of which can be tight. Training is free, but you are not compensated for it, and it is intense. The only computer/education requirements are a validated email account, a 2-year degree, and high-speed Internet on your PC or laptop. There is also an ETS review on this blog. The company hires part-time employees to score test results for various online and offline educational institutions including SAT scores. Each scoring opportunity will have its own requirements, and you do have a schedule in which to commit. Pay is twice weekly via check and ranges from $10 to $20 an hour if you can accumulate enough hours. Even though you have to commit to a schedule, you do get to set it yourself. Some scoring will have a minimum requirement of 4 hours. Training can be up to two weeks before you have to take your final certification, and you may begin working immediately upon completion of training. Some do find the training difficult and have had to retake the final tests, so you might want to really slow down during testing. You are given two tries and paid for both attempts. You do NOT need to live in the USA to apply. There is also a review of Pearson's work at home scoring jobs on this blog. Pearson has been around probably the longest (over 50 years) and is recognized by many well-known educational institutions for being a leader in the scoring process for tests at all levels. With Pearson you are a part-time employee (health benefits included), and expected to work 20 hours a week. Pay is via direct deposit and is $10 an hour with the chance to earn more if you are bi-lingual or willing to work past 7 p.m. You can also earn more for a high performance. While the computer requirements are relaxed, you must have at least a Bachelor's Degree in any field and be a US citizen. Sorry, no hiring outside of the US. #4 – Score Essays, Tests, and Performance Assessments With Measurement, Inc.
Another review written on this blog about the scoring jobs at Measurement, Inc.. They offer work at home test scoring jobs. If hired, you would get to score all levels of essays, tests, and performance assessments for both government agencies and educational institutions. The work is usually temporary and done project-by-project with the busiest times being from January to June. You are considered a temporary staff member (employee) without benefits and pay is $10.70 an hour via direct deposit. A Bachelor's Degree in any field is required for this job. This site is for those wishing to grade math problems, papers, essays, and almost anything from K-12. “Gradiate Geniuses” are also asked to supply feedback to both students and parents. As an independent contractor, you may earn up to $25 an hour depending upon how fast you can work. Training takes roughly 2 hours and must be completed within 24 hours of acceptance. It looks like you will need only a 2-year degree or commensurate experience for this, but must also pass several online assessments to see if you would be a fit. You must be a US citizen and pay will be via direct deposit. Graduate is no longer in business. So, there you have it. Another way to make money may be to become a scorer/evaluator at any one or all of these sites. Good luck! P.S. – If you're looking for more work at home jobs that are guaranteed to be legitimated, you can check out FlexJobs. This is a site we use and trust here at Real Ways to Earn. You can get 30 percent off your subscription using promo code AFFILPROMO. Too bad some of these require a Bachelor’s Degree because I’m sure there are plenty of us more than capable of performing these jobs. I’ve seen hideous grammar and spelling from people with Bachelor’s Degrees. Not to mention from people in upper management positions. I would like to apply for a test scoring essays job!!! How do I do that??? You can just click any of the links for the companies mentioned in this blog post, and it should take you to the page where you can apply, if they are currently hiring. Except for WriteScore. You have to search for their jobs on the CareerBuilder job search site. Actually US citizenship is not required for Measurement Inc; permanent residents and anyone who is legally authorized to work for any employer in the United States is welcome to apply to work at Measurement Inc.
@Marilynn – I think I had seen that it did change since the full review of Measurement was written. I had also written about Measurement some place else (can’t remember where), and I think that may be the new eligibility requirements.